Allie M. Roach received her B.Sc. in Biology from Westminster College and was also awarded an Honors Certificate upon completion of the college’s interdisciplinary Honors Program curriculum. 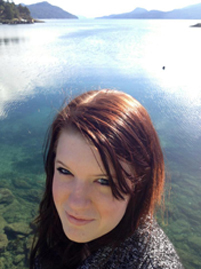 In 2011, Allie was awarded the Honors Independent Summer Research Grant for her work on isolating hydrocarbon-degrading extremely halophilic archaea from a contaminated hypersaline environment (Great Salt Lake). Allie joined the Duffield Lab in September of 2012 as an Associate Scientist, providing support to the lab by being involved in a number of research projects and by acting as the lab manager. She is especially interested in mitochondrial biology and cell stress, and is currently pursuing a Master of Liberal Arts degree in Biotechnology at Harvard University, School of Extension Studies. Gomez IG*, Roach AM*, MacMurdo M, Dang L, Marsh G, Johnson BG, Lemos D, Duffield JS. Targeting mitochondrial dysfunction in kidney disease by Nrf2 activation promotes anti-oxidant and mitochondrial biogenesis pathways. In Progress. 2016. Nakagawa N, Barron L, Gomez IG, Johnson BG, Roach AM, Kameoka S, Jack RM, Lupher ML, Gharib SA, Duffield JS. Pentraxin-2 suppresses Activator Protein-1 signaling to ameliorate fibrotic disease of the kidney. In submission, 2016. Gomez IG, Roach AM, Nakagawa N, Amatucci A, Johnson BG, Dunn K, Kelly MC, Karaca G, Zheng TS, Szak S, Peppiatt-Wildman CM, Burkly LC, Duffield JS. TWEAK-Fn14 activates myofibroblasts to drive progression of fibrotic kidney disease. Accepted for publication at J Am Soc Nephrol. 2016. Nakagawa N, Xin C, Roach AM, Naiman N, Shankland SJ, Ligresti G, Ren S, Szak S, Gomez IG, Duffield JS. Dicer1 activity in the stromal compartment regulates nephron differentiation and vascular patterning during mammalian kidney organogenesis. Kidney Int. 2015 Jun;87(6):1125-40. Kawakami T, Gomez IG, Ren S, Hudkins K, Roach A, Alpers CE, Shankland SJ, D'Agati VD, Duffield JS. Deficient Autophagy Results in Mitochondrial Dysfunction and FSGS. J Am Soc Nephrol. 2015 May;26(5):1040-52.